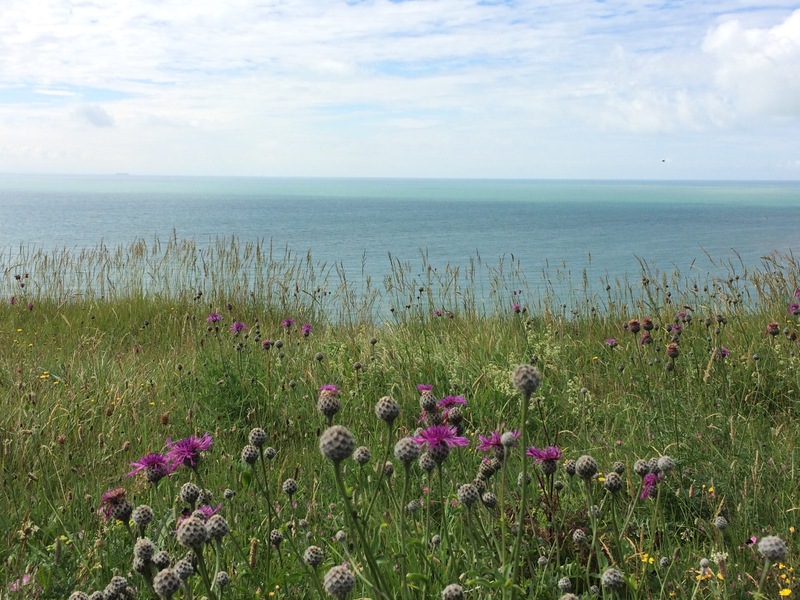 The wildflowers here on the chalk clifftops are absolutely breathtaking at the moment; they have been looking beautiful for a while but seem to have reached a peak this week. I find myself dawdling while the dog goes on ahead; she occasionally looks back to make sure I’m still in range. I’m too busy looking at the little yellow vetches and rough hawkbit; the bright-pink pyramidal orchids (there’s a patch of about 30 in long grass on the sea-side of the cliff path); the delicate, lilac-coloured field scabious; the thistly purple knapweed… And there are many plants that I am unable to identify which frustrates me – I must get a good wildflower book. Whatever they are, they all blend together to create a wonderful natural tapestry. These pictures were taken with my phone camera and aren’t amazing quality, I’m afraid. Taking photos with my DSLR while walking the dog, having to juggle dog lead and poo bags, is rather too high-risk for my liking. I’m looking into getting a decent compact camera that will fit into my pocket and that I can operate with one hand on dog walks! 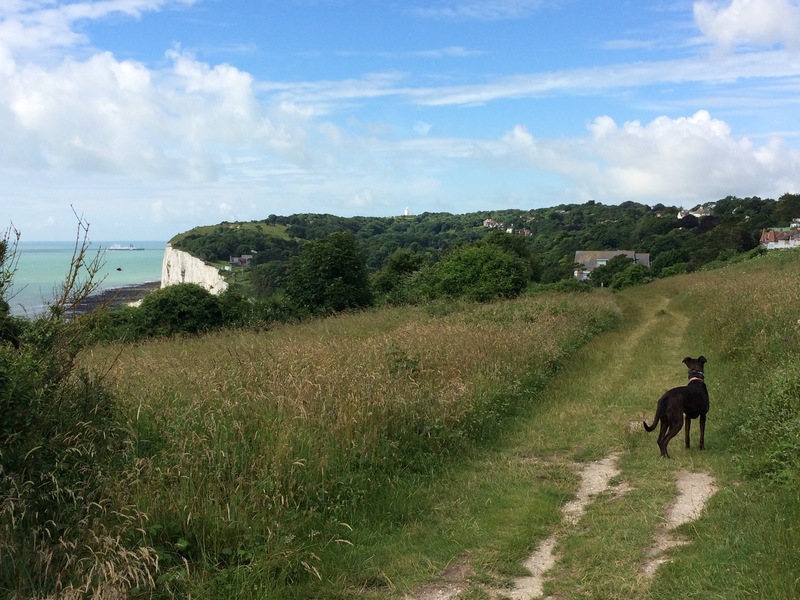 The wildflowers look lovely, but for me, living in Australia, those lovely sea views and white cliffs are pretty special too. Our wildflowers seem to be particularly lovely right now as well, and I don’t seem to be able to manage a walk without the camera coming out. So far, like you, I’ve only brought the camera phone, but I’m thinking I’d better get the DSLR out, although also like you, I find it a bit unwieldy. . . . I enjoy these photos as is, honestly — the blue sky, the sea, and all the colourful blooms. . . I love how your wildflowers look much like ours … but also different. I thought the purple was clover at first and then realized it was something I did not recognize at all (knapweed, I guess). I highly recommend looking into a small point and shoot camera. They are inexpensive and quite good now. Best of all, they fit in your pocket. I love my little Canon. Dear Sam, For what it’s worth, this last set, Tapestry, opens full screen when I click on them! Gosh, what a beautiful place. I would love to be able to see so many wildflowers, along with the sea! Just beautiful. Thank you for sharing, Sam. 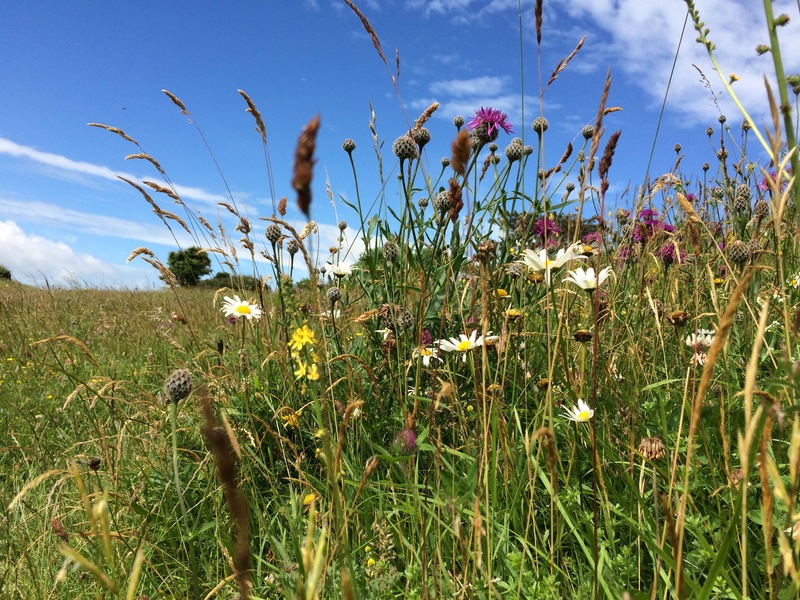 Coastal walks and wild flower meadows a lovely combination. 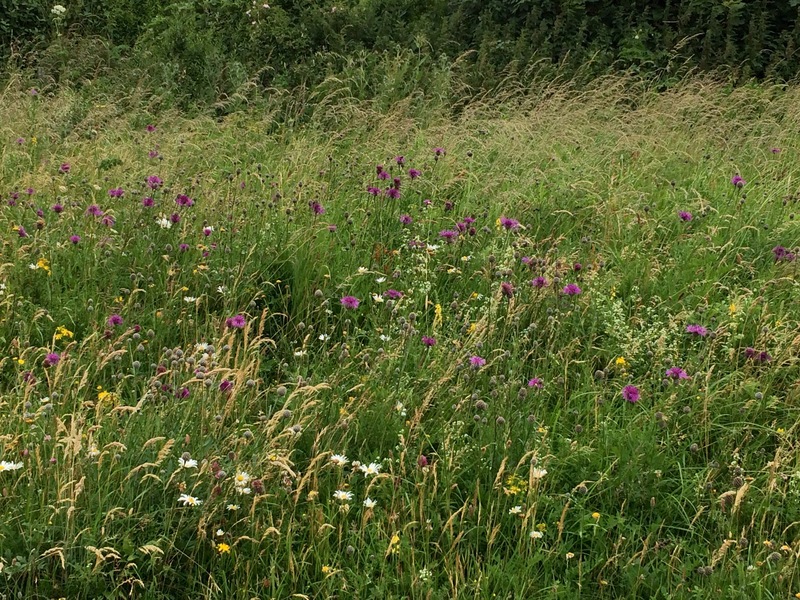 We have to get in the car and drive to one of the Worcestershire Wildlife Trust sites to find a wild flower meadow. What glorious walks you have with amongst the flowers with the sea in sight. The field edges around here are bursting with colour too, though sadly pyramidal orchids don’t grow on our heavy clay soil. I so envy your dog walks. The views are tremendous. What a magical place to walk the dog. Lovely to see some summery blue skies too. The flowers in the grasses do make a wonderful tapestry don’t they! Very pretty indeed. I hope that you find a camera you like, although your photos look very good to me! Beautiful photos of your cliffs Sam. 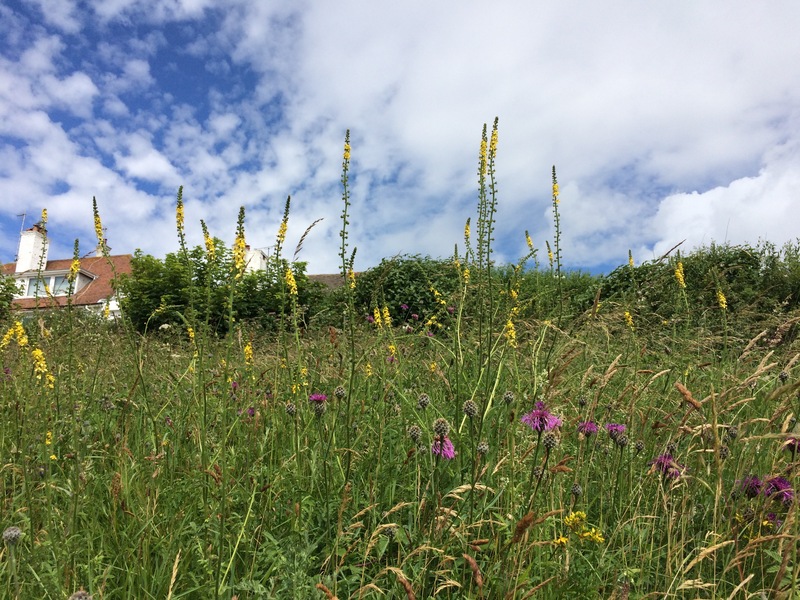 The wildflowers on our chalk downs are looking especially lovely this year too and everywhere is so green. I love getting on my knees to try and count the number of different plants. Today I was particularly struck by wild thyme and scabious growing together. Our local hay fields have been cut this week and I’m hoping it’s not too wet to bale them into hay, so much prettier than silage. Yes I have more or less abandoned my heavy camera with its annoying popping off lens cap too, but the iPhone does have its limitations. The wildflowers are so pretty at this time of year. I had a chance to rest in one such meadow on a walk near Bateman’s recently. It was so peaceful. A summer field of long grass and wildflowers. Few things are more satisfying.